It’s been one helluva great week of fishing in Fort Lauderdale. The dolphin are biting excellent, some sailfish are around and biting, big groupers and other big bottom fish are biting… lots of activity out there on the reefs. The cold snap we just had over the weekend has really gotten the sailfish frisky. And with the stiff winds, it’s the perfect conditions for kite fishing. Sailfish are concentrated in 100-200ft of water, a line of water about a mile off our coast affectionally called ‘Sailfish Alley’. This is the area just outside the reef and inside edge of the Gulfstream, a perfect zone with a lot of available food for pelagic predators. The dolphin fishing is really getting good too. We’re getting them on our drift fishing trips and our sportfishing charters. 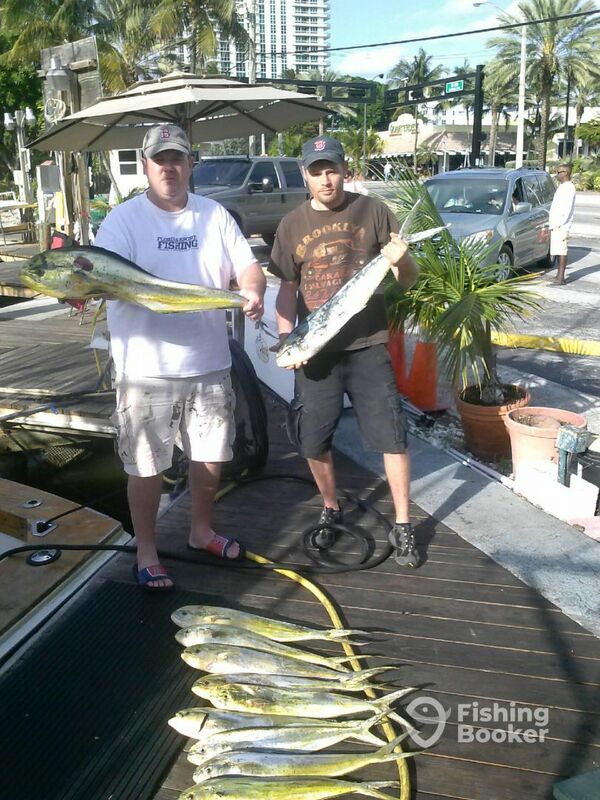 Sportfishing charters have the definite advantage in dolphin fishing because they go trolling. But savvy anglers are hooking into them on the drift too. Most dolphin have been schoolie sized, with a few bigger ones mixed into the bunch. Wahoo are out there in good numbers too, also being caught on the troll. Wahoo are argued to be the fastest fish in the ocean. When a wahoo hits your line, there is little doubt of it being anything but a wahoo. Drag screams off the reel like you just snagged a nuclear submarine. It’s obvious that a fish shaped like a torpedo is built for speed. One of the best eating fish out there, wahoo are always a prized fish. We’ve been catching an inordinate amount of wahoo this week. February is one of the hottest months for wahoo. This great fishing is just the prelude to our best season on the year… March, April and May. The best 3 months of big game fishing off our coast is getting rolling now. This is the start of our big game fishing season in Fort Lauderdale and all evidence points to this being a banner year for us. We don’t crush them on every single trip, but the fish are definitely out there and waiting to be caught. Good luck to everyone fishing with us in the coming weeks. Have fun and catch’em up! I am a 3rd generation fisherman in Fort Lauderdale. I started in 1967 as a mate on one of the local drift boats. I fished with my dad who also worked the boat and taught me how to fish. When I was old enough, I began working as a mate on the sportfishing boats. As the years passed, I got my captain's license. I took a private sportfishing captain's job for about 8 years where the owner of the boat and I fished the Bahamas Billfish Championship tournaments, all through the Bahamas, Caribbean and south Florida. In 1994, I took out a $30,000 loan to buy a charter boat and start my own business, for me and my sons. A couple years later, we bought a drift boat, the Catch My Drift and we've been drift fishing off the coast of Fort Lauderdale every day since. The Catch My Drift is Fort Lauderdale's largest and only air-conditioned drift boat. We run 3 trips every day and nobody fishes more than we do. There are several captains of the boat: me, my sons Rod and Andy, and Stu and Bill.